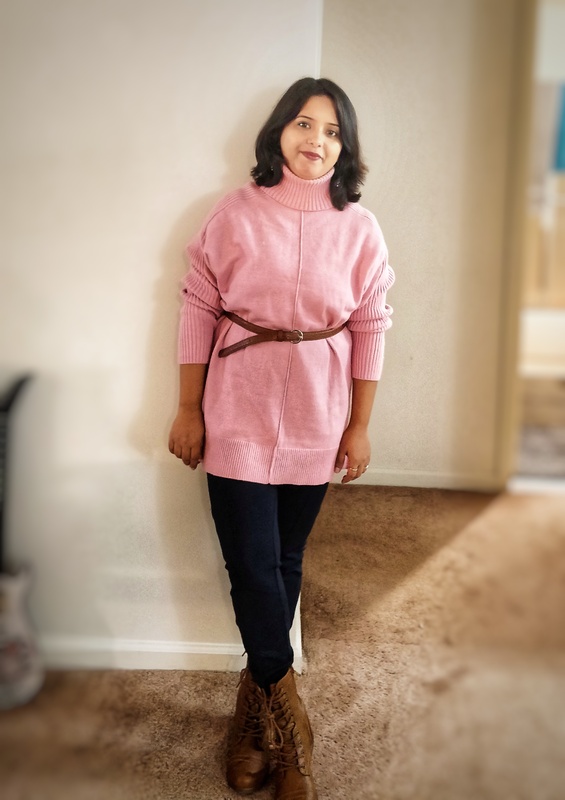 Being comfortable yet looking stylish is always my mantra.So here I am going to show you how I styled my oversized cowl-neck sweater to give it a trim and stylish look. 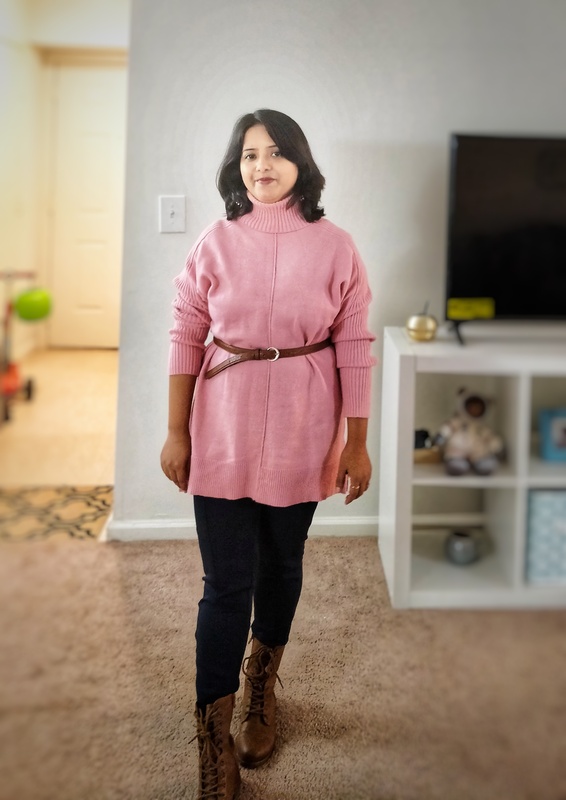 While choosing an oversized sweater you have to be little careful about the length of it as a long oversized sweater may look great on taller people but can make your legs look shorter if you are not that lucky with height.So I chose this cute and cozy cowl-neck tunic style pink sweater with just perfect length,not too long,not too short. The thumb rule to follow when you are wearing an oversized top or sweater is to balance it with a nicely fitted tailored bottom.In that way you can reduce the bulkiness of the whole outfit.So that’s exactly what I did while choosing the bottom to pair with this.I selected a well fitted leggings.The navy blue color also goes so well with the baby pink sweater. 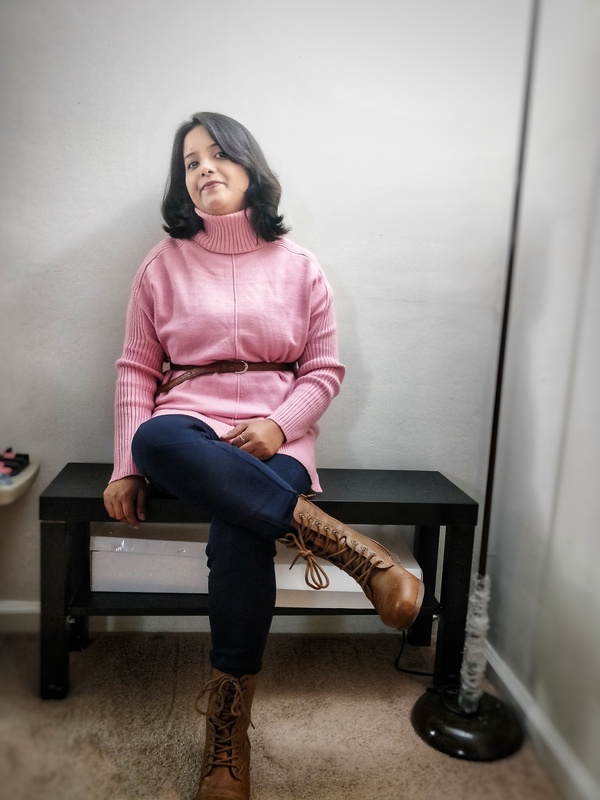 Belting your oversized sweater is the best way to give it a trim look and accentuate the waist line.Thin belts work best with oversized sweaters as a wider belt can make your torso seem shorter. 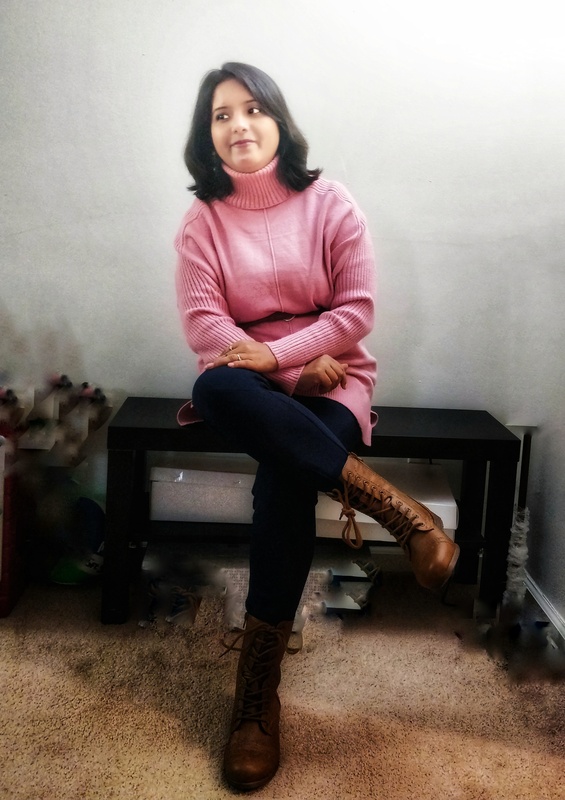 Matching or pairing any two items,from your accessories such as your boots and your belt, can transform the way your whole outfit turns out .Color pairings can help you to look polished and put together.So that’s what I did while selecting the colour of the belt and boot to give it a more polished look. Do let me know if you liked this look and how do you style your oversized sweaters. Love a cozy sweater! So cute! Love this oversized sweater. The belt idea is super chic! I love skinny belts, I have one for all basic colors. Oversized sweaters are the best!! So comfy and flexible! Thank you for this post! I love how you styled this sweater! It’s so pretty!